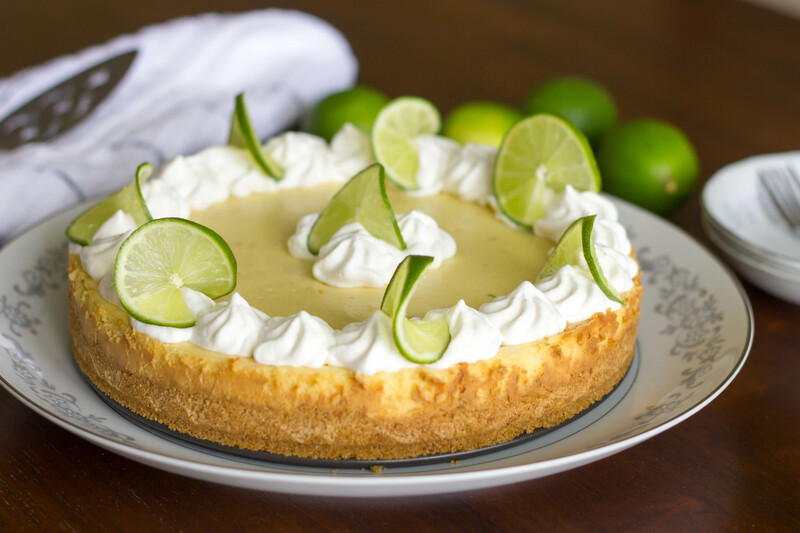 Calling all my fellow citrus dessert lovers, I’ve got just what you need this Memorial Day weekend! 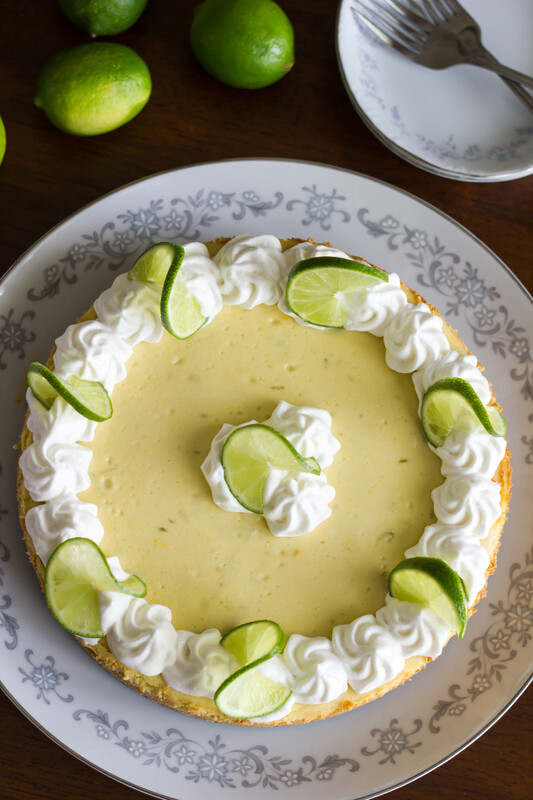 =) I love all citrus desserts, but I especially love ones that involve lemon and lime (these lemon bars and this key lime pie are two of my absolute favorite desserts ever!). Oh yeah, and I also love cheesecake ;). 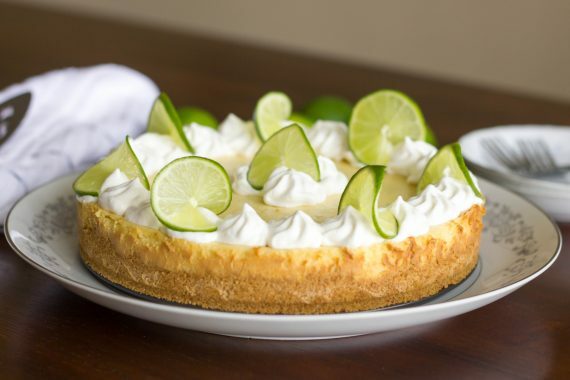 So combining key lime pie and cheesecake pretty much sounded like the best idea ever…and I loved it! And so did all my taste testers. It’s the perfect treat for summer – cool and creamy with just the right balance of sweet and tart. Go ahead and make this cheesecake tonight for all your cookouts tomorrow. Enjoy! 1. Preheat the oven to 300 degrees F. Position the oven racks so one is just above the middle position and the other is in the bottom third of the oven. Lightly grease a 9-inch springform pan. 2. In a medium bowl, stir together the graham cracker crumbs and sugar. Add the melted butter and mix until the graham cracker crumbs are evenly coated in sandy in texture. Press the mixture into the bottom and 1/2-inch or so up the sides of the prepared pan. 3. Bake the crust for 15 minutes. Remove from the oven and let cool while you prepare the filling. 4. In a large bowl with an electric mixer (or in the bowl of an electric stand mixer), whip the cream cheese, sugar, cornstarch and lime zest together until smooth and creamy, 1-2 minutes, scraping down the sides of the bowl as needed. Add the lime juice and mix until combined. Add the eggs and mix until just combined (over mixing can cause the cheesecake to crack while baking thanks to all the extra air beat into the filling). 5. Pour the cheesecake filling over the crust and spread evenly. Place a metal 9X13-inch or similar-sized pan on the bottom rack of the oven and pour in 2-3 cups of boiling water. Immediately place the cheesecake on the upper rack and bake for 50-65 minutes until the cheesecake is set around the edges. A slight jiggle in the center of the cheesecake is fine. 6. Turn the oven off and prop the oven door open about 4 inches. Keep the cheesecake in the oven for 30 minutes. Remove and let cool completely. 7. Refrigerate the cheesecake overnight. Garnish with whipped cream and lime slices or lime zest, if desired. This looks so delicious! You captured the best of both with this combo!